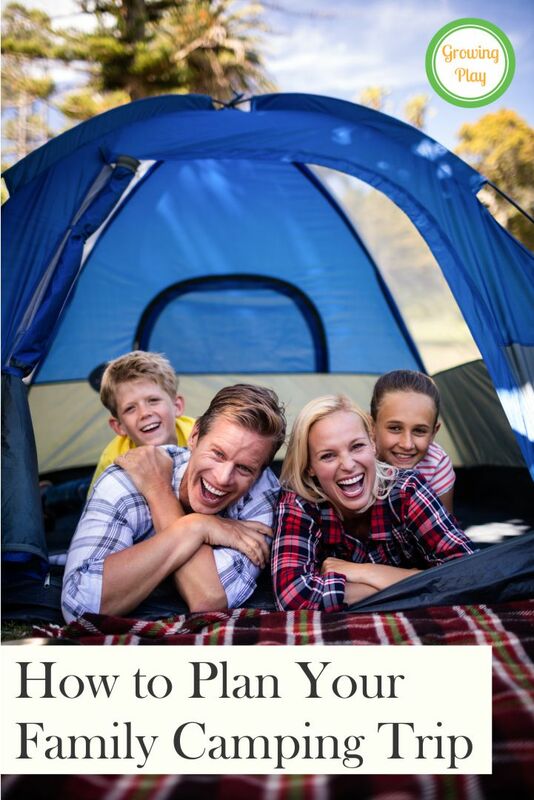 If you are going camping this summer or even thinking about going camping, you will want to read my top 10 tips on how to plan your family camping trip. My family and I have been camping for over 17 years either in a tent, pop-up camper or a camping trailer. For the past 10 years, we have only been camping in a trailer and it helps to make camping much easier. You might think that camping doesn’t require much thought. Just pick a campsite, grab your supplies and head out. In reality, it requires quite a bit of planning to make the camping trip go smoothly. Not nearly as much planning as a Disney trip but it is still very helpful to be prepared. You will enjoy camping so much more if you plan it out beforehand. The very first thing to do when planning your family camping trip is to choose your destination. 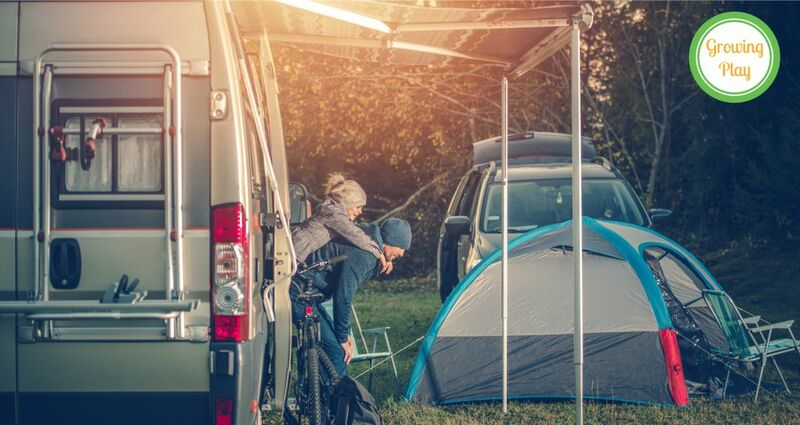 Where you go will inform many of the rest of the decisions that you need to make about the camping trip – including clothing, supplies, and activities. Without knowing the destination, you can’t plan anything else. So, pick your destination first. Once you know your destination, research the area further. That way you’ll know what type of camping accommodations exist. Are you allowed to use a tent? Is there a place for your RV? Are there cabins for rent or toilets and showers? This information will help you know what to bring with you on your trip. When we first started with our pop-up camper we wanted only campgrounds that had pull through campsites. We were not great a backing the camper into a tough spot. Plus, it usually started an argument between my husband and I. Men hate backseat driving and women hate feeling like the kids are in danger. It is a lethal mix. Haha! Pick a pull through spot if you are newbies hauling a camper. Once you know what’s available taking your children’s ages and everyone’s likes into consideration, start planning what you’ll do there. You don’t want to plan every single moment of the trip because you want to allow for time to hang out and read or just enjoy nature. But having at least one planned activity each day will help everyone to enjoy their trip. A planned activity could mean walking to the camp store, playing at the playground, fishing or swimming. This is probably my most important tip. You don’t really need to plan for it extensively but just know that if the weather takes a turn for the worse get your thinking caps on for creative ideas. Find things that you can do if the weather is bad, because it’s not likely you can just go to a movie. Make sure you bring plenty of reading material, board games, coloring books, activity packs, and playing cards in case that happens. You can still have a relaxing time reading real books, playing games, and connecting as a family. When you are planning anything, it’s imperative that you take into account the ages of your children. If you have many ages, then you can switch up activities often so that no one gets bored or upset. Think about planning activities around young children’s nap times and bedtimes. Even though you’re on vacation, children do thrive with normal schedules and it’ll make it easier on the family. How will you prepare your meals? When we went tent camping, I prepared as much as possible in advance. For tent camping, we always used a Coleman propane stove. Now that we use a camping trailer there are really no limits how we can prepare our food. It can be fun to plan a meal or two that you will cook over the fire. The kids always think this is awesome. Keep it SUPER SIMPLE. Hot dogs on a stick work the best for sure. We tried spaghetti one year and it took FOREVER to boil the water over the fire. Foil pack dinners are fun and easy but prepare early – it takes a lot longer to cook over the fire. Camping is much more relaxing when you menu plan before you go. Taking into consideration the ages, likes, and dislikes of your kids, also take time to plan meals and snacks that everyone will enjoy. If you’re doing a lot more physical activity than normal, you may need more snacks. Some good choices are trail mix, fruit, and even boxed cereal like Chex and Cheerios. DOWNLOAD A FREE CAMPING MENU PLANNER. The other important thing to plan for is packing the right clothing. That means for everyone. You’re not going to have a way to wash anything while you’re camping, so make sure to bring extra clothing and shoes for each person for each day. Remember the nights can be cool even when the days are hot so a sweatshirt is necessary. If you are anywhere near water (ie stream, river, lake, ocean, etc) bring a bathing suit for the kids. As you know, if there is water kids will find a way to get wet. Whether it’s hiking boots, water shoes, or a raincoat (depending on where you’re going), you need to bring the right gear to keep everyone safe and comfortable. What you bring is highly dependent on what is available from the campsite, or whether you’re roughing it in the backwoods or not. During your planning process, create a checklist for everything that you want to bring with you so that you can pack everything a lot easier. Once you have the checklist, you can start packing for your trip, marking off the things you’ve packed. For older kids, you can let them oversee their own checklist, but do check it to ensure that nothing is forgotten. Sometimes after spending all day outside, I am super tired by the time we start the campfire. I always plan ahead with a few calm campfire games to entertain the kids that require NO equipment. That way we can all sit for a little bit, mesmirized by the campfire flames and play a simple game. Waiting Games digital download includes twenty games to play while on a road trip, waiting for an appointment or sitting around a campfire. This collection of activities encourages children to develop self-regulation, creativity and communication skills while we sit around the campfire. I always have a printed copy of this packet in the camper. Find out more. Sometimes I am not in the mood for a game around the campfire, but I always love to chat and catch up with the kids. Try playing Camp Chat to get the conversation going with questions about camping, the outdoors, memories and more! Planning is an essential component of any successful fun family vacation but camping especially can be much more enjoyable and relaxing if you are prepared. Keep in mind, if things don’t go as planned, don’t sweat it. Kids will have fun camping no matter what the situation! 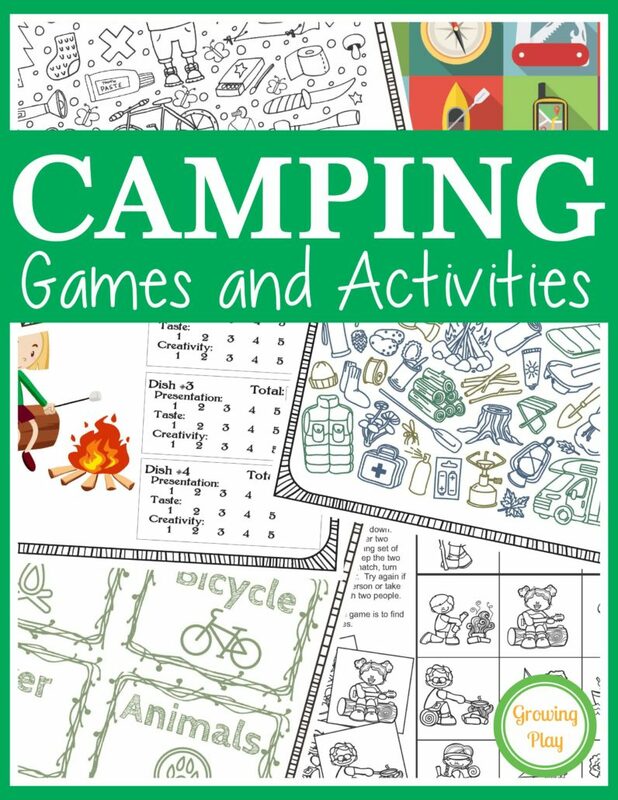 Camping Games and Activities includes 25 fun puzzles, mazes and games to play while on a camping trip or anytime! Remember this is a digital document. You will receive a link immediately following payment to download the Camping Games and Activities.